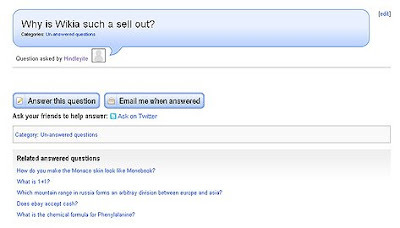 Illogiblog - The Illogicopedia weblog: Wikiquestions: Why is Wikia such a sellout? Wikia is never afraid of stealing other peoples' ideas and using them to their own advantage. At least Illogicopedia acknowledges its parodies - Wikia is becoming a parody of itself. Also, get Jimbo's ugly fizzog out of my face!